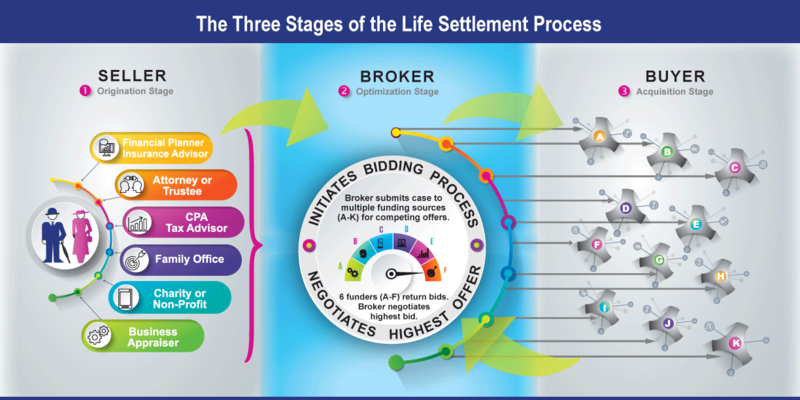 As illustrated in the infographic above, the life settlement process begins with the policy owner. Typically this occurs when a policy owner is feeling burdened by costly premium payments and may be thinking about letting the policy lapse. In most cases, they reach out to their insurance professional before allowing the policy to lapse or surrendering it back to the carrier. In other instances, the insured’s financial or professional advisor conducts an annual review of the client’s policy and determines that the policy is no longer performing as anticipated, or is no longer needed for estate planning purposes. In both cases, the policy owner is draining their cash assets to fund premium payments for a policy that is no longer needed or wanted. Professional advisors (e.g. financial planners, CPAs, attorneys, insurance agents, etc.) have an obligation to recommend the most suitable solution for the client’s unwanted or underperforming policy. In most instances, the client’s options include (a) reducing the death benefit to lower the premium payments, (b) surrendering the policy back to the carrier, (c) allowing the policy to lapse, (d) or selling the policy in the secondary market. Once the advisor and the policy owner have concluded that the life settlement is the best possible solution for the policy, the next step is to engage the services of a skilled life settlement broker who can source the case to multiple funders in the secondary market and negotiate the highest possible settlement. It’s important that policy sellers and their advisors understand the role of life settlement brokers as compared to the role of life settlement providers (funders). While brokers have a duty to the policy seller, life settlement providers, on the other hand, have an obligation to their investors and capital sources to purchase policies at the greatest discount possible. Their goal is to pay as little as possible for each policy they acquire. That's why it’s important for advisors and policy sellers not to skip the brokering stage by accepting a direct offer from a provider. By eliminating the bidding process involving multiple funding sources, the seller will never know if he/she could have received a higher amount for their policy from a different funding source. Pre-qualifies the applicant (often by phone) before initiating the formal application process. Helps facilitate the closing process involving the provider, advisor and/or seller. During the policy acquisition stage, the life settlement provider purchases policies either through a broker or directly from the policy owner. Providers may acquire and hold policies as part of their own investment strategies, or they often function as intermediaries for other institutional investors who purchase the policies from the provider. Each provider typically has several capital sources with different purchasing guidelines and investment objectives. Purchasing guidelines typically include specific criteria regarding the insured’s age, life expectancy, the carrier rating of the policy, amount of premium payments, the investment “worthiness” of the policy, and other factors. Once the provider extends an offer and the seller accepts, contracts are signed. At this point the provider will deposit the settlement funds into an escrow account. Once the carrier has transferred ownership or changed the beneficiary of the policy from the seller to the provider (buyer), the escrow agent will release the settlement funds to the seller.